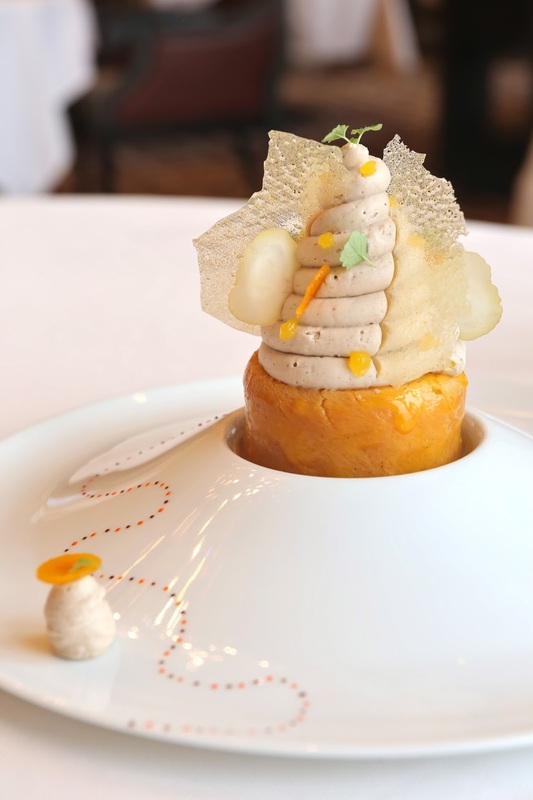 L'oursin, le cœur de saumon fumé d'ecosse - a layer of smoked Scottish salmon, plus a layer of fennel jelly with sea urchin, topped with a thick layer of fennel mousse. Garnished with sea urchin, caviar, croûtons, and crème fraîche with a few sprigs of dill. Almost ethereal on its own, but even more satisfying on blinis. While not exactly Café Anglais' Blinis Demidoff from Babette's Feast, I'm sure this was no less enjoyable. I simply shoved the whole blini into my mouth... and somehow, a smile just appeared on my face. This soup came with chestnut purée, raw and cooked chestnuts, quenelles of pheasant, foie gras cubes, and black truffle. Love the soft, truffled quenelles, and of course the chestnuts whose sweetness helped temper the slightly-heavily seasoned soup. In the middle of the bowl was a custard made with pike perch, monkfish, and egg which had been pan-fried (with a very thin layer of bread?) until crispy on one side. The accompanying onion consommé was made with Château-Chalon. Garnished with some sautéed mushrooms. It's no surprise the dish with white truffle on top smelled heavenly. But even without the truffles, the alluring fragrance of vin jaune in the consommé came through. The consommé itself tasted simultaneously sweet, acidic, and a little alcoholic. As for the custard? Silky and fluffy, but ever-so-slightly crispy on one side. Just gorgeous. Enfin! Il est arrivé! La pièce de résistance! 2007 François Villard Saint Joseph Reflet - served chilled so it's more refreshing. Nice acidity here with sharp precision. A little smoke, a little mineral and metallic. A great wine to go with a heavy, gamey dish selected by Sebastien. The hare was wrapped in caul fat, and stuffed with a block of foie gras surrounded by a ring of blended hare offal and black truffles. Classic textures and flavors. The chefs said that they made the roll shorter in diameter and cut thicker slices to make the experience more satisfying. Tagliolini with black truffle - this was a "side dish" to the heavy main course, and... surprise, surprise... it was actually heavier than the main course! I don't think I've ever had a pasta course that used more rich cream and butter... this was bordering on the ridiculous. So rich, in fact, that it almost put me over the edge. The only reason I persevered and ate all of the pasta? All those little bits of black truffle in the sauce, and there was a lot of it. Oh and those shavings of black truffles didn't hurt, either... The fragrance from the truffles was just incredible. I knew the kitchen wouldn't let us off so easily, given that they've recently gotten themselves a brand new pastry chef. Sure enough, Chef Nicolas Lambert delivered three deserts to our table. Baba au rhum, mandarine Corse - the baba is soaked in mandarin juice and vanilla, then it's hollowed and stuffed with mandarin segments, Corsican mandarin sorbet, and topped with chestnut cream with mandarin tuiles. I love citrusy desserts because they're so refreshing, and this was no exception. The chestnut cream was so light that it went perfectly with the mandarin. Le chocolat Tanariva - chocolate meringue at the bottom with white truffle ice cream, Tanariva chantilly, and white truffle cream. Plus white truffle shavings, of course! What's not to like?! La tarte au choclat - ganache made from Macaé chocolate sandwiched between two layers of chocolate feuillantine, with chantilly made from Guanaja (dark chocolate) and Tanariva (milk chocolate), and cocoa tuiles on top. A chocolate lover's dream. Mignardises came, and yes, we finished these, too... We've got cream puffs filled with confit pear and cream, chocolates with vanilla ganache, and citrus macarons with lemon, lime, and orange ganache. The macarons even look like oranges. Cute. This was a fantastic meal. In my two previous visits after Chef Fabrice Vulin's arrival, I had been impressed by the quality level of his cuisine. Today the kitchen took it up to another level, and we gave our compliments to Chef Vulin and Sous Chef Jonas Noël. As for the desserts, I do agree with what The Man in White T-Shirt said: in all these years, the desserts at Caprice had never looked as pretty as they do now. It seems that Nicolas Lambert used to work at Plaza Athenee, so I assumed he might have learnt something from Christophe Michalak. You have a tough job. Excellent review.